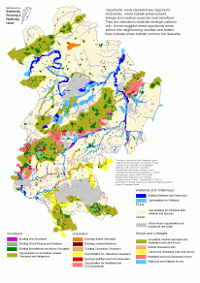 What is the biodiversity character of the various landscape units of Bedfordshire and Luton and how do the BAP targets relate to these areas? Where in Bedfordshire and Luton are the areas of greatest potential for the conservation, enhancement, restoration and creation of BAP priority habitats? Is it possible to identify opportunities for reduced fragmentation of habitats by building ecological networks which will allow expansion of populations of important species and allow species movement across landscapes?